Cryptolist with a twist. 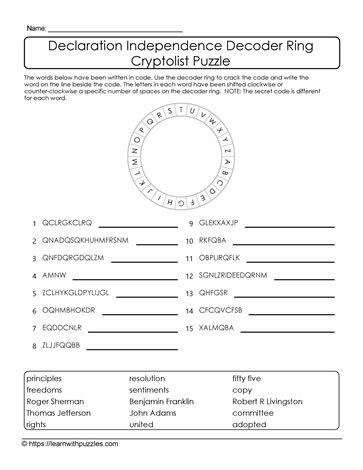 This is a cryptolist printable puzzle about the USA Declaration Independence. It engages students' problem solving skills as well as increasing vocabulary building skills because they need to decrypt, or decode, the letters. Students can use the decoder to determine the pattern of letter substitution. Note that each new encoded word follows a different rule for decryption. Suitable for students learning about the Declaration Independence. Include in homeschool curriculum to complement the program. Differentiate instruction for earlier grades and ELLs.